Clinton was asked a question about whether "political correctness" was hurting Democrats. She responded that "what's often called political correctness is politeness," before talking about Democrats' love of diversity. "I don't want to go around insulting people. I don't want to paint with a broad brush; every immigrant is this, every African-American is that, every, you know, other person with different religious beliefs or whatever — that's childish," Clinton told journalist Kara Swisher. That was when things began going downhill, first with Swisher. Swisher asked Clinton what she thought of black Senator Cory Booker's call to "kick them in the shins." Swisher was referring to comments made by Eric Holder, Obama's Attorney General, who is also black. Holder called on Democrats earlier in October fight harder with Republicans, using the metaphor: "When they go low, we kick them." "Well, that was Eric Holder," not Cory Booker, Clinton told Swisher before the journalist corrected herself. "Yeah, I know they all look alike," Clinton quipped. "No, they don't," Swisher flatly responded. The audience erupted in laughter moments after Swisher refuted the notion. The idea that all black people look alike is an old, racist trope in the United States. "Well done," Swisher told Clinton. 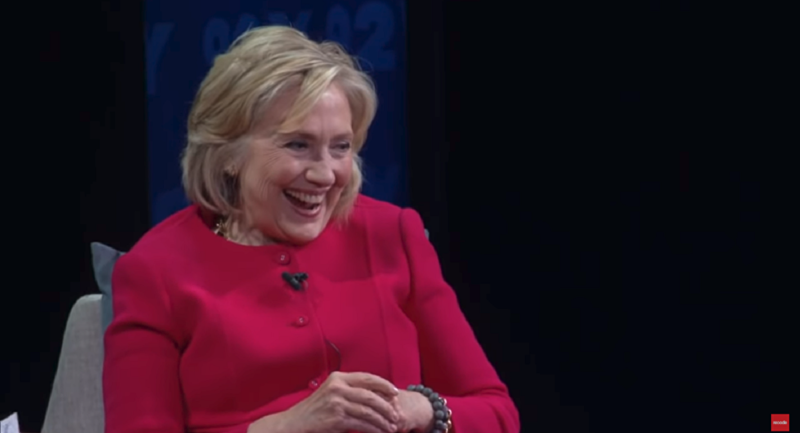 "You know Hillary- " she continued before Clinton made another joke, telling the audience that Facebook founder Mark Zuckerberg paid her to say that. Left: Former US Attorney General Eric Holder. Right: Senator Cory Booker. To be clear, Eric Holder and Cory Booker look nothing alike, even at the most superficial levels. Holder has graying hair and a moustache, while Booker is bald and clean shaven. Clinton was criticized during the 2016 election after appearing in a comedy skit with New York City Mayor Bill de Blasio. In it, Clinton thanked de Blasio for his endorsement, telling him, "It took you long enough." "I was running on CP time," the mayor told her. "Cautious politician time," Clinton responded. "CP time" is slang for "colored people's time," which denotes the stereotype that people of color are always late to things. Clinton was also confronted during the election about comments she made in 1996 referring to black teens as "super predators." In June, Sputnik News reported that Clinton told an audience of college students in Dublin, Ireland that Russian President Vladimir Putin was leading a "white supremacist" movement.